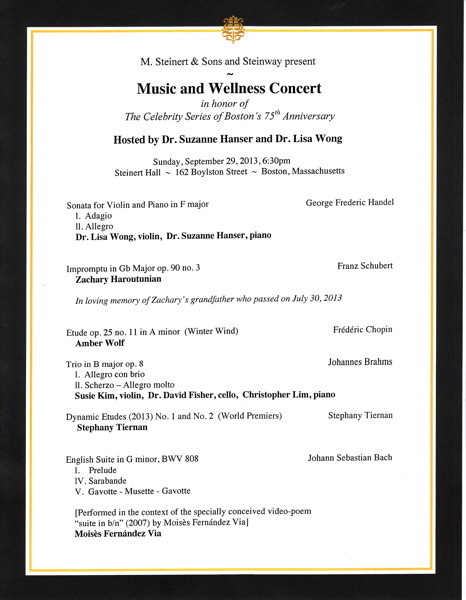 On Sunday, September 29, local music and medical professionals Dr. Suzanne Hanser and Dr. Lisa Wong hosted a Music and Wellness Concert in honor of the Celebrity Series of Boston’s 75th Anniversary. 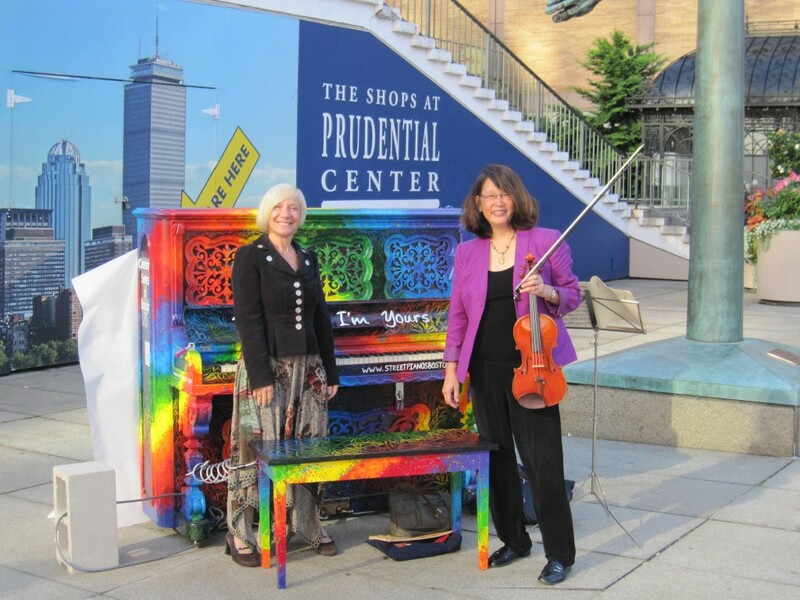 Inspired by, and in collaboration with the recent Celebrity Series event “Play Me I’m Yours”, Dr. Wong and Dr. Hanser designated September 29th Music and Wellness Day, inviting Boston to take part in events raising awareness for music as a healing modality. The concert was the last event of the day, and reflected the culmination of the efforts between The Celebrity Series of Boston, M. Steinert & Sons, Dr. Suzanne Hanser and Dr. Lisa Wong. 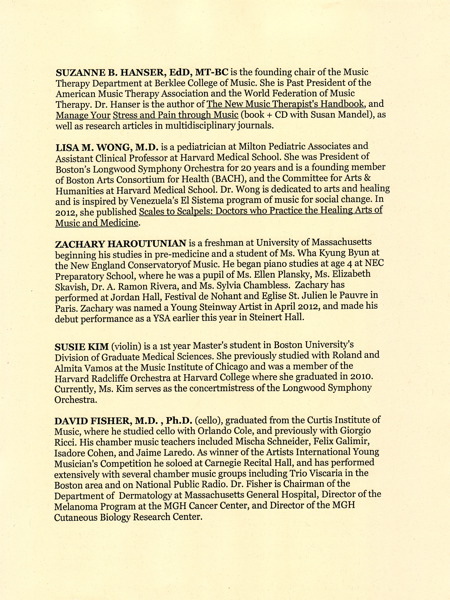 It provided a platform for many of Boston’s finest local artists to express themselves through the power of music, and provided the audience with the opportunity to hear presentations given by both Dr. Hanser and Dr. Wong. 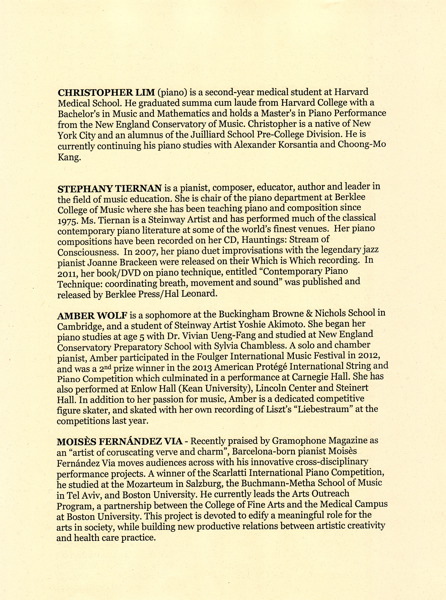 We invite you to view the presentations, *read the biographies and program notes, and listen to the moving performances of nine talented and devoted Boston musicians.